- Xiaomi Redmi Note 7 is now available on sale in Singapore; here's all you need to know. Earlier this year, Xiaomi launched its Redmi Note 7, the first smartphone under the company’s sub-brand “Redmi.” While it’s a sub-brand, don’t let that fool you because the Redmi Note 7 has a bunch of loaded specs that you can enjoy at an affordable price. The phone comes with an impressive 48-megapixel main camera paired with a 5-megapixel aperture depth sensor on the back and a 13-megapixel front shooter. Instead of Sony IMX586 sensor that has been used by Xiaomi in its Mi 9, Redmi employs Samsung ISOCELL GM1 sensor which also combines adjacent pixels to make a bigger surface for light impact. The Redmi Note 7 is powered by Qualcomm’s Snapdragon 660 coupled, runs on Android 9.0 Pie software, and comes with 4 GB RAM. The Redmi has a 6.3-inch FHD+ IPS display panel with 1080x2340 resolution. Its battery boasts of 4000 mAh and supports Quick Charge. The smartphone offers 32 GB and 64 GB internal memory options, plus an external memory of up to 256 GB. The Redmi Note 7’s front panel is covered in Gorilla Glass 5, and its side frames are made from polycarbonate. The phone sports rounded corners and look relatively sleek for a mid-range device. 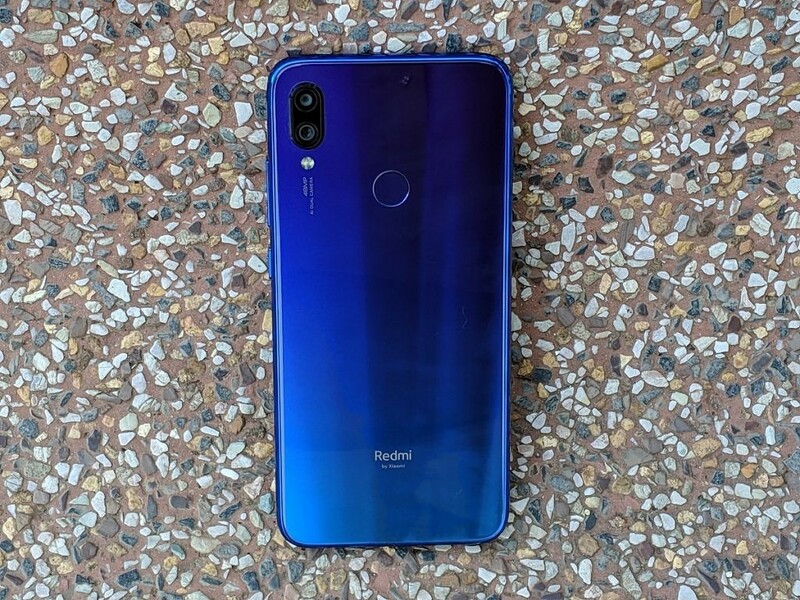 The Redmi Note 7 has a gradient finish that changes hues depending on the light. Unlike most smartphones today, the Redmi doesn’t sport the highly popular in-display fingerprint sensor. Instead, it went with the traditional capacitive sensor which the company claims to be more accurate and responsive. The phone also sports an audio jack and a USB-C port for charging. The Xiaomi Redmi Note 7 is now available in Singapore and can be purchased for as little as $308 for the 64GB and $338 for the 128GB with the same 4GB of RAM for both variant . That phone package comes with a user manual, charging adapter, USB-C cable, and a semi-transparent silicone case. Shade-wise, the device comes with the current gradient color trend for Sapphire Blue and classic Onyx Black color for consumer who prefer more sophisticated looks.